Signature : Yokoyama Kozuke Daijyo Fujiwara Sukesada. Bizen Osafune Jyunin. Habaki : Silver wrapped single habaki. Blade length : 56.21 cm or 22.13 inches. Sori : 1.97 cm or 0.77 inches. Width at the hamachi : 3.08 cm or 1.21 inches. Width at the Kissaki : 2.14 cm or 0.84 inches. Shape : Rather wide and thick, deep Sori, long kissaki. Jigane : Komokume mixed with Koitame, Jinie attached, small Chikei working. Hamon : Suguha with Ashi around Monouchi to Kissaki, deep Nioikuchi. Boshi is maru and Yakisage style. Special Feature : Yakoyama Kozuke Daijyo Fujiwara Sukesada was a son of Shichibei Sukesada. He was born in 1633 and died in 1721 at the age of 89, lived quite a long life. Devastating flood of Yoshiikawa river hit Bizen area and weakened swordmakers, to make things worse, low demand for Japanese sword made many swordmakers hard to make a living. 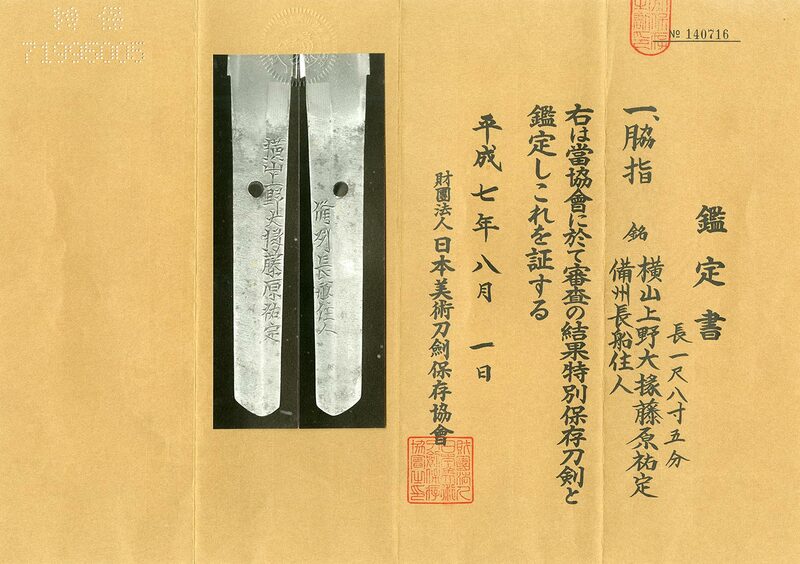 Despite such hardships Sukesada worked hard and made nice swords. Tsuba : Round shape, made of iron, leaf design. Menuki : Made of copper, bamboo leaf design. Fuchikashira : Made of iron, wave design. Kozuka : Made of copper, Nanakoji, chrysanthemum design. From Aoi Art : Yakoyama Kozuke Daijyo Fujiwara Sukesada was one of wekk-known swordsmith in Bizen in Edo period, so that there are many Gimei swords. The signature of this sword is genuine, this well made sword has NBTHK Tokubetsu Hozon paper already. The hamon appears very clearly and brightly and Nioikuchi is deep around Monouchi.